"We're opening. It's time." If those words frightened any the 20 freshmen scholars in Indiana State University's Networks Professional Development Program they didn't show it, as they hosted an International Dining Experience for more than 50 Scott College of Business faculty, staff and fellow scholars. "It was all a little intimidating at first," said Olivia Havenor, a financial services major from Plainfield whose team sought help from Nicholas Debly, an Indiana State student in the MBA program who is from Russia and works in Terre Haute, to create an accurate presentation. "But we contacted the caterers and photographers, invited the guests and created the education presentations about the countries. As Networks Scholars, we are leaders and are used to getting things done on our own, but in this activity we had to learn how to work as a team to get things accomplished." Kate Arndt and Reagan Elston, both Networks scholars, each won the FPA-Greater Indiana – Bedel Financial Advisors scholarship. The scholarship is awarded to an undergraduate student pursuing a career in Financial Planning at a College or University in Indiana. In order to be eligible for this scholarship, an applicant must be enrolled as a full time, undergraduate student at a College or University in Indiana, hold a minimum 3.0 GPA or better (based upon a 4.0 scale), and demonstrate leadership in academic and extracurricular activities. L to R: Kate Arndt and Reagan Elston with Abby VanDerHayden, FPA-NextGen Director/Bedel Financial, at the FPA meeting on Friday, November 13th. Indiana State University's Networks Financial Institute will host the "Property and Casualty Insurance Forum: Insuring the Future and Beyond" in Indianapolis on Oct. 23. Organized in partnership with the Insurance Institute of Indiana, the forum will run from 8:30 a.m.-2 p.m. at the Columbia Club and will include discussions on the insurance and regulatory challenges in the areas of unmanned systems, telematics, cybersecurity and transportation networks. State lawmakers on insurance committees will also share insight on how government is dealing with these challenges at the state level. Indiana State University and the Scott College of Business welcomes its new Networks Financial Institute, Gongaware and President's Scholars. 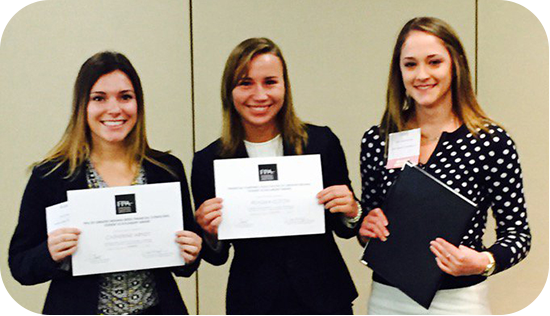 Eight students have been awarded the Networks Scholarship for 2015. Four have been selected by the Gongaware Center to participate in the 2015-16 class of Gongaware Scholars and of the twenty President's Scholars, six will be joining us in the Scott College of Business. An Indiana State University professor sought to assure investors following Monday’s volatile day on Wall Street, advising them not to overreact to stock market fluctuations. "It’s just a market correction," said Reza Houston, assistant professor of finance and Networks Financial Institute's Director of Research. "The overall health of the U.S. economy is pretty darn good." 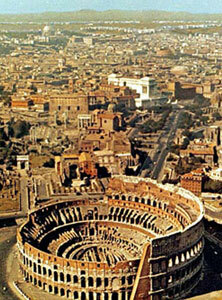 On top of the sights and sounds of Italy, Indiana State University students will delve into how entrepreneurship and microfinance operate in the country during an eight-day trip in August. Led by Scott College of Business management professor Aruna Chandra and instructor Kim LaGrange, 19 students will travel to Italy, Aug. 1-9, where they will participate in industry/incubator visits and academic presentations at the University of Rome, St. John's University in Rome and visit the European Space Agency. A new Policy Brief, 2015-PB-02, "Insurance Regulation in the Dodd-Frank Era" by Hester Peirce, Senior Research Fellow at George Mason University's Mercatus Center is now available from our Policy Briefs page. Peirce proposes that in the nearly five years that have passed since Dodd-Frank became law, the future of state regulation of insurance is not looking as secure as it did at the law’s inception. She explores a different approach: reforming insurance regulation embracing an idea that was suggested before the crisis — single state regulation of insurers. All of NFI's publications are accessible from our publications pages. 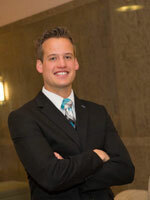 Insurance and risk management major Brandon Nettrouer of South Whitley, Ind., is a natural leader and has been extremely involved on campus," said Rebecca Wray, MBA director at Indiana State’s Gongaware Center. "He will be doing an internship with Gibson Insurance — of which president and CEO Tim Leman is an alumnus — in South Bend this summer." Brandon Nettrouer, an insurance and risk management major from South Whitley, was excited to learn he was a finalist prior to the ceremony and knew he had won when a Gongaware Scholar was mentioned. "There was a lot of hard work, a lot of sacrifice to achieve that honor, so it really meant a lot for me right then and there-and it hit me very hard. It was tough to keep my composure because at that moment, as I'm sitting there, my mind was racing, my closest fraternity brothers were patting me on the shoulder, friends were looking over at me, and it overloaded me with pure happiness." said Nettrouer. When Yahzmine Rodriguez, a marketing major from Indianapolis, decided to study abroad for a semester in South Korea, she knew nothing about the country. So when she returned to campus this spring, she — as expected — had learned a lot about her hosts, but she also learned a lot about herself. She is also a recipient of Indiana State’s prestigious President’s Scholarship and Networks Scholarship for business students. 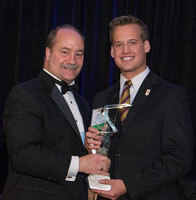 Brandon Nettrouer, a junior insurance and risk management major and Pi Kappa Alpha chapter president at Indiana State, accepted the Chapter Award of Distinction at the April 19 award ceremony and said, "This award is extremely humbling to receive and it fills me with pride and appreciation for the efforts of my fraternal brothers." In a nomination letter, Indiana State University President Dan Bradley said the Pi Kappa Alpha chapter’s accomplishments are "important to the university and to me personally." The Networks Professional Development Program hosted fundraising events for the Terre Haute Humane Society, culminating at the baseball game against Indiana University on April 14. Beginning Monday, March 30th, the Networks Professional Development Program will be hosting a fundraiser for theTerre Haute Humane Society. The fundraiser will occur from March 30th to April 14th. Below is a list of items most critically needed by the Humane Society. If you would like to participate, please drop off your donation items in the bin outside of the Networks Offices, Suite 105. For any monetary donations, you can return the pledge form in an envelope to Paula Riggen in the Networks Office #104 of Federal Hall. The address is to the left under "Contact Us." This two week drive will culminate to an event on Tuesday, April 14th. Networks has partnered with the Indiana State University Baseball Team to continue the fundraising and donation drive at the ISU/IU game at 6:00 pm, that evening. The Humane Society will also be on-site with some of their animals that are looking for homes. Come out and support the Humane Society as well as our own Indiana State Baseball team on April 14. The federal government has the backs of insurers and their clients as they seek to protect themselves from, and adapt to, the fast-evolving threat of cyber attacks, Federal Insurance Office Director Michael McRaith assured an industry crowd last month. "We want to support the insurance industry as it seeks to protect itself from cyber incidents," McRaith said during the Networks Financial Institute 11th Annual Public Policy Summit in Washington, D.C. "Cyber protection should be as strong as it is for any other financial institution." This article also appeared in Claims Journal of April 9, 2015, with the title "Feds Support Insurers Seeking Protection From Cyber Attacks"
The Network Scholars are hosting a Dine to Donate event to support Catholic Charities. This event is coordinated by the Networks Financial Institute to raise awareness of hunger in the Wabash Valley. One in seven families in Terre Haute live under the poverty line. For $0.27 cents a meal, Catholic Charities can help feed one person, so please join us to end the issue of hunger and poverty in Terre Haute by participating in "Dine to Donate" at Texas Roadhouse on Wednesday, April 8th. Bring the physical or digital copy of the flier to Texas Roadhouse on Wednesday, April 8th between 4 pm-8 pm, and Texas Roadhouse will donate 10% of your total food purchases to Catholic Charities. Again, please don't forget the flier. Carry-out is accepted, but please be sure to show the flier before payment. For $0.27 cents a meal, Catholic Charities can feed a person. 1 in 7 families in Terre Haute live under the poverty line. Beginning Monday, March 30th, the Networks Professional Development Program will be hosting a fundraiser for the Terre Haute Humane Society. The fundraiser will occur from March 30th to April 14th. 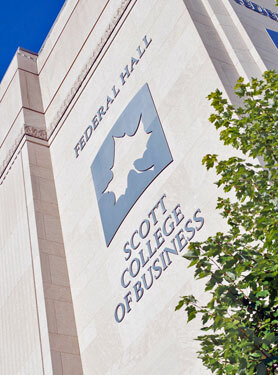 Faegre Baker Daniels and FaegreBD Consulting were pleased to partner again with Networks Financial Institute (NFI) and the Scott College of Business at Indiana State University in presenting the 11th Annual Insurance Public Policy Summit in Washington, D.C. on March 17, 2015. This year's Summit focused on the impact that domestic and international insurance regulations have on the industry in the United States and around the world. Leading federal insurance experts in the United States have reiterated their support for international capital standards (ICS) for globally active insurers despite industry concerns that international regulators are moving too quickly with the plans. Best’s News Service quoted Federal Insurance Office Director Michael McRaith and Federal Reserve Board senior insurance advisor Tom Sullivan as saying international capital standards were needed to stave off regulatory arbitrage and ensure insurers are competing on a global playing field. "The first objective is to complete some version of the ICS by 2016," said Mr. McRaith during the Financial Institute’s annual Insurance Public Policy Summit. A. M. Best has expressed some doubt that a tight timeline to finalize and launch insurance industry international capital standards can actually be met. That’s due, in part, to a "scarcity of common ground." The International Association of Insurance Supervisors, a Swiss-based group of regulators from nearly 140 countries, plans to finalize international minimum capital standards by December 2016. IAIS officials also hope to win membership adoption of those standards by the end of 2018. But A.M. Best sees those deadlines as questionable. Speaking at an event in Washington D.C. on March 17, Federal Insurance Office Director Michael McRaith said that insurers could see some version of an international capital standard by 2016. 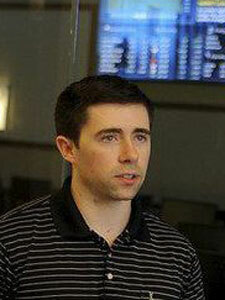 He added, however, that the change would be incremental rather than industry changing. Support the Insurance Industry’s Self-Protection from Cyber Incidents. Support Continued Development of Cyber-Related Insurance Products. Two of the federal government's top insurance experts reiterated their support for an international capital standard for globally active insurers, despite concern from industry representatives that international regulators are moving too quickly to impose such a standard, according to this week's issue of BestWeek. 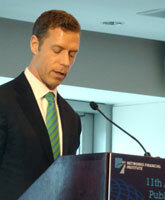 Speaking during the Networks Financial Institute's annual Insurance Public Policy Summit, Federal Insurance Office Director Michael McRaith and Tom Sullivan, the Federal Reserve Board's senior adviser on insurance, said an international capital standard is necessary to stave off regulatory arbitrage and to ensure insurers across the globe are competing on a level playing field. Insurers could see some version of an international capital standard by 2016, Federal Insurance Office Director Michael McRaith told a recent gathering of industry professionals in Washington, D.C.
"The first objective of 2016 is to complete some … primitive version of the international capital standard, [but the] expectation is that it will not be a final magical formula," McRaith said during the Networks Financial Institute 11th Annual Insurance Public Policy Summit on March 17. "We will move one step forward to the ultimate goal." 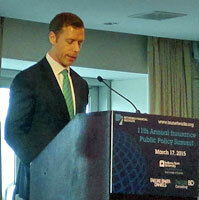 PCI’s CEO Dr. Sampson addressed the Networks Financial Institute’s 11th annual Insurance Public Policy Summit. Kevin M. McCarty, NAIC Past-President and Florida Insurance Commissioner highlighted several NAIC priorities at the Networks Financial Institute’s 11th Annual Insurance Public Policy Summit. McCarty’s remarks included updates on key domestic and international issues facing state insurance regulators. The federal government has the backs of insurers and their clients as they seek to protect themselves from, and adapt to, the fast-evolving threat of cyber attacks, Federal Insurance Office Director Michael McRaith assured an industry crowd on March 17. AIAs Leigh Ann Pusey speaking about int'l & domestic insurance regulation at the Insurance Public Policy Summit. When Indiana State University junior Yahzmine Rodriguez decided to study abroad for a semester in South Korea, she knew nothing about the country. So when she returned to campus this spring, she - as expected - had learned a lot about her hosts, but she also learned a lot about herself. 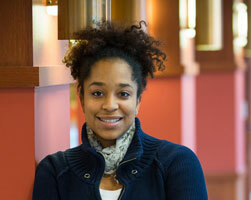 Rodriguez's interest in studying abroad was partially fueled by a summer research experience with the university's Institute for Community Sustainability. 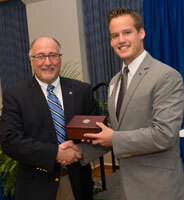 The marketing major from Indianapolis is also a recipient of Indiana State's prestigious President's Scholarship and Networks Scholarship for business students. Leading experts in Congressional, state, federal and insurance industry thinking will provide insight into the hurdles facing U.S. and international markets at the 2015 Networks Financial Institute's Insurance Public Policy Summit in Washington, D.C. The 11th annual summit will be held March 17 at the Ronald Reagan Building and International Trade Center. The theme for the summit, which is organized by Indiana State University's Networks Financial Institute with support from Faegre Baker Daniels, will be "Complex Challenges of International and U.S. Policy Regimes: Who's in Charge Here?" The ethical questions surrounding end-of-life decisions are many, but the answers were far from simple for a group of professionals and students from medical and legal fields who tackled the issue during a panel discussion at Indiana State University. "With current technology, the accurate diagnosis of most diseases and their prognosis are rapidly made, affording a patient an opportunity for choices," said Dr. Jim Turner, medical director for the Richard G. Lugar Center for Rural Health at Union Hospital and a panelist for Tuesday's discussion. "If a debilitating and fatal outcome is anticipated, patients deserve to understand their legal and medical options." The speakers at the 11th Annual Insurance Public Policy Summit to be hald in Washington, D.C. on March 17, include: Senator Joe Donnelly (D-IN), Congressman Blaine Luetkemeyer (R-MO), Governor Dirk Kempthorne, Commissioner Kevin McCarty (FL), Michael T. McRaith, and Thomas R. Sullivan among other industry experts. The panelists for the Right To Die discussion on the ethics of physician assisted suicide on Tuesday, March 3, 2015 at 7:00 pm in Dede I of the Hulman Memorial Student Union have been announced. A once rising star of the financial industry who served two years in federal prison for wire fraud and a discussion on an individual's right to die will be among the highlights of the upcoming Ethics Conference at Indiana State University. Organized by juniors in the Networks Financial Institute's Professional Development Program, the 10th annual conference will be 10 a.m.-4 p.m. March 4. "We want people to realize that ethics is important and impacts people every day," said Kate Arndt, a junior finance major from Westmont, Ill. and a conference planning team leader. "No one is immune to it." Complex Challenges Of International and U.S. Policy Regimes: Who’s in Charge Here?